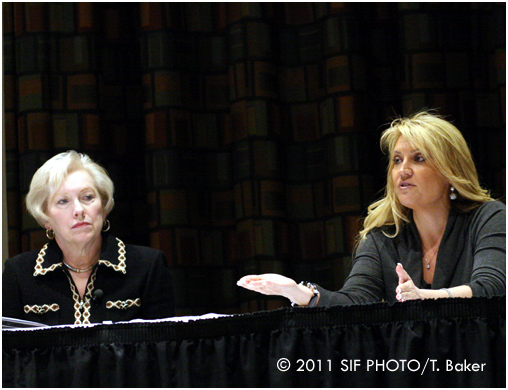 SUNY Chancellor Nancy Zimpher (left) and Lucky Napkin co-founder Amilya Antonetti spoke at SUNY Morrisville during the Women Ventured-Women Gained Discussion last week. SUNY Chancellor Nancy Zimpher gave tips to students at SUNY Morrisville earlier this month for the Women Ventured Women Gained program. She told them: 1) You need a vision; 2) Make no small plans; 3) Ideas without action are meaningless; 3) Hold yourself accountable and 4) Find someone to articulate for your vision. 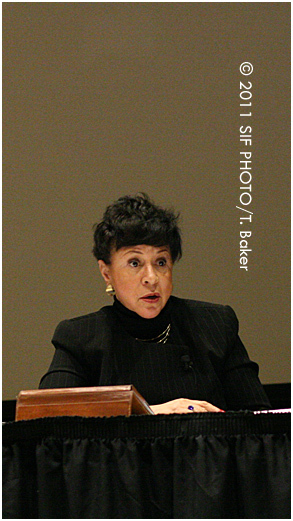 Entrepreneur Sheila C. Johnson also participated in the panel discussion. She started her career as a teacher before co-founding BET. Johnson now heads a hospitality company that operates resorts. She is also part owner of three Washington, DC-area professional sports teams and says her media division will soon re-brand AOL Black Voices. Johnson told SUNY Morrisville students to use creativity to communicate their vision to the world. Award-winning entrepreneur and green business pioneer Amilya Antonetti,founder of Antonetti Soapworks and co-founder of the Lucky Napkin, gave these tips: 1) True passion is hard to describe; 2) You can’t succeed by yourself; 3) Trust your choices; and 3) Believe you are invincible.